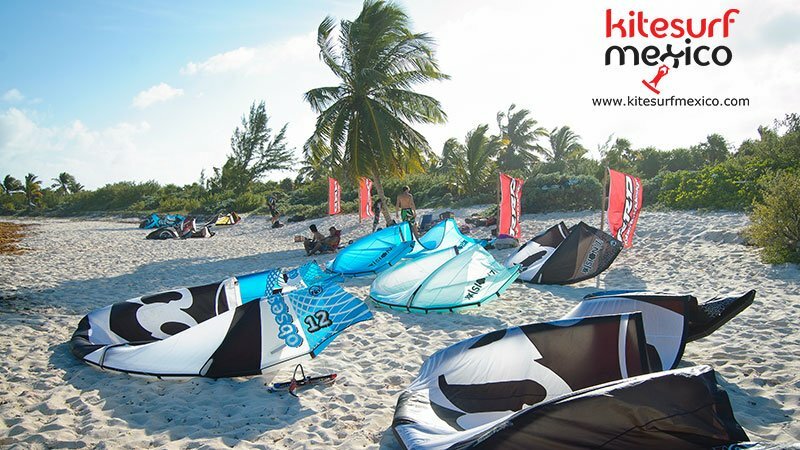 Kitesurf Mexico is the only kite school in Playa del Carmen that has a private, exclusive beach with no public access in the heart of the Riviera Maya. just 8 Km. south of Playa del Carmen, inside Punta Venado Caribbean Eco Park, 1990 hectares of Jungle and 2.5 Km. of beautiful pristine Caribbean Beaches. This area includes our school, which is on a bay that offers the perfect conditions for kiteboarding, free from tourists and other kiters. The spot offers the first 30 meters (90 feet) of shallow, calm water, which allows us to teach kiteboarding under the best safety conditions, thus making it faster for the student to learn this wonderful sport. Best Season: January, February, March, April, May, June, November, and December. Useful Wind directions: NE-E-SE-S, side onshore, 80% of the time. Clean wind and clear waters, sometimes flat or with smooth waves depending on the wind direction.